In the late 1940s, Zionist paramilitary forces drove 700,000 Palestinians from their homes while establishing the state of Israel. A series of events will take place across Britain in the coming days to commemorate the anniversary. The ethnic cleansing was exacerbated further in 1967, when Israeli soldiers occupied the Gaza Strip and the West Bank, displacing hundreds of thousands of Palestinians. 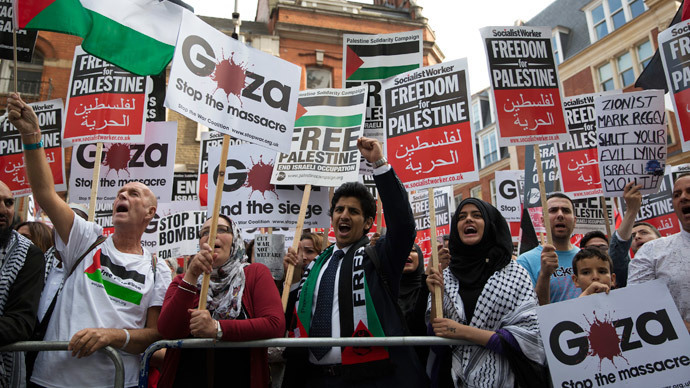 Human rights activists and pro-Palestine campaigners will hold a series of events in London, Ipswich, Bristol, Brighton, Birmingham and elsewhere to mark the brutal tragedy. Commonly referred to as the Nakba (catastrophe), they warn the process of ethnic cleansing continues today. Sixty-six years later, an overwhelming majority of expelled Palestinian refugees have been unable to return to their villages. Instead, they have been forced to raise generations in refugee camps. In excess of 5 million Palestinian refugees are battling for the simple right to return to their homes, a right Israel persists in denying them. A further 1.6 million Palestinians face grueling discrimination in Israel and are forced to live under oppression as second class citizens. In excess of 50 Israeli laws have been implemented since 1948 that discriminate against indigenous Palestinians who managed to remain in their homes in the wake of the Nakba. Almost two million Palestinians are living under a military siege in Gaza maintained by Israeli forces. Palestinians living under occupation in Gaza are denied a series of fundamental rights, including the freedom to move, access to clean water, food, medicine and electricity. Over 1.7 million Palestinians also live under occupation in the West Bank, imprisoned by an Israeli wall critics and human rights advocates warn violates international law. In addition to this, Israel continues to annex Palestinian settlements in this region. According to UK social justice group War on Want, almost 6,000 Palestinians are detained as “political prisoners” in Israeli jails and detention facilities, where torture is common. Many of these prisoners are detained in the absence of charges or a trial. In the face of these struggles, Palestinians continue to fight for justice, calling upon grassroots campaigns worldwide to boycott Israeli goods and services until the Israeli government obeys international law. Gazans are also highly vulnerable to military assaults conducted by the Israel Defense Forces (IDF). In the summer of 2014, more than 2,000 Palestinian men, women and children lost their lives during Israel’s military bombardment of the coastal strip. Events across the UK organized to commemorate the Nakba and the crisis of displaced Palestinians include a war memorial in Brighton and a Palestine Museum in Bristol. Both events, set to occur on Friday, have been organized by the Palestine Solidarity Campaign (PSC). The campaign is also involved in organizing a special day of commemoration in Kensington Gardens, Central London and another on Upper Hanover Street in Sheffield on Saturday. Since 2011, Israeli law has made commemorating the Nakba in public difficult for Palestinians and Israelis. The “Nakba Law” empowers Israel’s finance minister to retract funding from organizations that reject Israel as a “Jewish state” or mark Israel’s Independence Day by holding events relating to the tragedy. Although this legislation is yet to be implemented, human rights groups and campaigners say it has been designed to intimidate Palestinians who view the founding of the state of Israel as a catastrophe.